Long has the debate raged whether the Fan Shroud of Turin was really the fan shroud Jesus used on his 1969 Datsun wagon or merely a clever imposter. Skeptics point out that cars were not invented for over 1800 years after the time of Jesus. While this may be true, we have to remember that God is omniscient, and who are those skeptics to say God didn't make a fan shroud before man made a car? Biblical scholars have found reference to the Fan Shroud throughout the Bible. While Christians acknowledge the Fan Shroud to be the one and only fan shroud owned by Jesus, Jewish scholars claim the Fan Shroud existed in the Old Testament long before any mention of Jesus. Both groups agree the fan shroud was used on an old Datsun, but Jewish Scholars question whether this was truly the 510 wagon of Jesus or possibly the 411 owned by Moses. We will present evidence here, showing various scriptures and artistic interpretations depicting the Fan Shroud of Turin both in the Old Testament and the New Testament. We first read of Adam and Eve in Genesis Chapter 2. 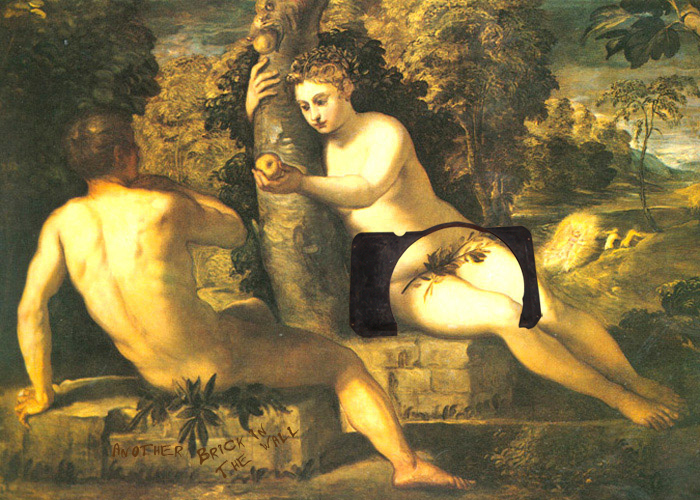 Adam and Eve lived happily in the Garden of Eden, and as depicted by 16th century painter Jacopo Tintoretto in his painting, "The Fall of Man", we see that Eve talked Adam into baking the first apple pie while Eve unsuccessfully tried to use the Fan Shroud of Turin to cover her shame.